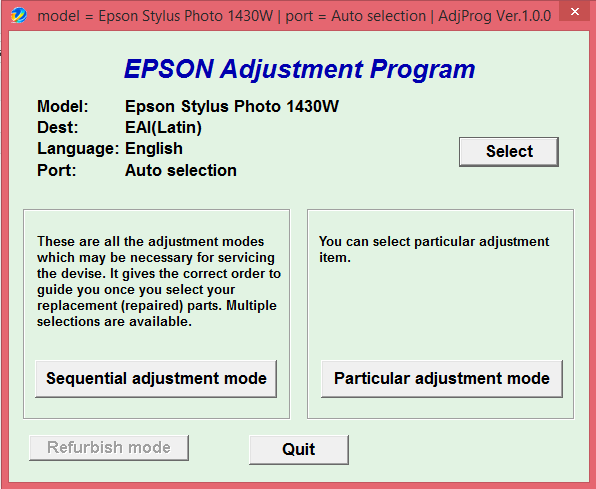 Adjustment program Epson Artisan 1430, 1430W - is a tool that allows you to reset the counter diaper (development, absorber) is not limited number of times, prescribe ID printhead, make printer initialization and other functions. The program will work on any computer with Microsoft Windows, tied to one specific PC is not. The number of discharges diapers errors (development, absorber) is not limited to, other functions are not limited. After paying and downloading the program, be sure to remove it from the file using the archiver program, for example, Winrar. Before using the program is required to watch video file "Видеоинструкция_a_p_epson_1430_1430W", otherwise, at random will likely not be able to understand. In the video instructions show how to reset the counter diaper (development, absorber). If something does not work, the question in any case, will decide in the flesh to us to connect to your computer with the help of Team viewer. Моя первая покупка в интернете, спасибо, что не дали разочароваться! Все работает!